Why did you decide to go on the Yanayacu Research Trip? When I came to Ecuador the first time, I knew I wanted a master's in entomology, it is a great place to be an entomologist. 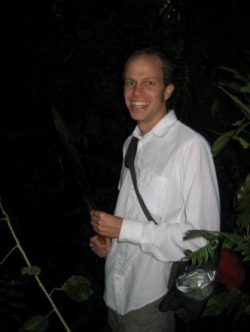 I was a research volunteer at Yanayacu for 6 months. While at the station I heard of Dr. Shaw's work with parasitoid wasps and caterpillars and decided to use his research as part of my master's thesis. I'm currently the manager at the research station. What was the most important thing you learned? I'd always read and heard about the diversity of these ares, but i learned to appreciate the forest. Deforestation is minimal in the area surrounding Yanayacu, but Ecuador in general has a huge problem. It has one of the highest rate of deforestation in South America. How has this experience changed you? I'm part of a biodiversity monitoring program, a forum where people investigate methods of sustainable development, from fair trade/organic cacao in the lowlands to fair trade lumber in the forests. There are women's groups and cooperatives that work with the native peoples in the area, the Quichua and Quechua, to find markets for their products. What are your plans for the future? There are opportunities here for me to earn in PhD, but for now at the end of my work here at the station manager, I'll be moving to the University of Texas at Austin. What advice would you give a young scientist? Science isn't impossible, don't get discouraged. You don't have to be at the top of your class or a nerd, which is what I thought as a kid. It can be cool to be scientist. Basically go around, flip over rocks and write down what you see, get muddy and wet, it 's exciting and fun.